The Secret Mermaid will be introducing a new cocktail menu come January, featuring many of their unique spirits sourced from all over the world. Pictured here is the Navy Penicillin, with Greenbar Distillery’s Crusoe Organic Spiced Rum and Fruitlab Ginger Liqueur. Surely, Captain Hook would find himself dancing in circles trying to find The Secret Mermaid. Hidden in walkway of Collyer Quay, under the guise of salad-bar Shinkansen, is a tasting room and cocktail bar featuring craft spirits from all over America. The land of freedom comes with a level of ingenuity, with bottles of Smoked Salmon Vodka from Alaska Distillery and lab-aged Santeria Rum from Rational Distillery lining it shelves. Offered on its own, for connoisseurs to savour, what really warrants a visit to this “hole in the wall” is the work (and infectious enthusiasm) of the main lady behind the bar, Kelly D’Cruz. The Secret Mermaid hand makes their own dried fruits for garnishes (and snacks) using a dehydrator. Not one for a huge crowd, the interior of The Secret Mermaid was a huge win for me. 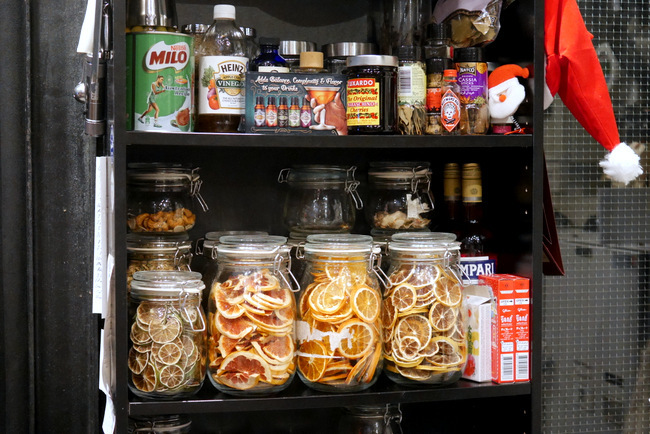 It is an intimate space, where one could sit by the bar or along the seemingly endless shelves of spirits, admiring. The best spot would be, of course, right by Kelly, where she works through her collection of bitters and glasses to shake up a drink of your choice. Head Bartender, Kelly Dcruz, of The Secret Mermaid whips up a refreshing Gin and Tonic using Few Barrel Gin and Yuzu Tonic Water from East Imperial. There is no better way to wind down, and refresh the mind than with Kelly’s Navy Penicillin to start. She unabashedly admits this is one of her favorites for it covers different profiles – sweet, sour and spice forward – all while packing a punch. While I am not a rum expert (or for any spirit, really, I just love a good drink), this is a great introduction to Lost Spirits Distillery‘s cask strength (68% ABV) Navy Style Rum. 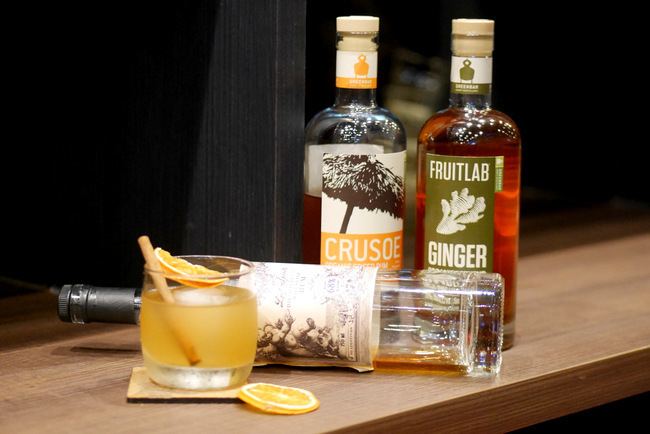 Left to float upon the combination of Greenbar Distilleries’ Crusoe Organic Spiced Rum and Fruitlab Ginger Liquer, the initial sip brings forth the waft of citrus (think lemon) and a huge kick of heat and spice. The smoothness of the cask strength and the hint of barrel char and smoke works well with the vanilla, cinnamon and candied ginger notes from the other two. Or, go for something a little simpler, but just as unique – the Barreled Gin Tonic. The star of the drink is the FEW Barrel Gin, said by the distillers and reviewers to be “brave and innovative”. Why? Because the gin was left to age in American bourbon and rye barrels. The juniper and botanicals open up to a smoky, charred wood profile, a profile we generally associate with whisky. It works just as great in an Old Fashioned, but, with Kelly bringing out the underlying bitter orange and lemon zest flavours in the spirit, we get a new dimension to the usual GnTs. 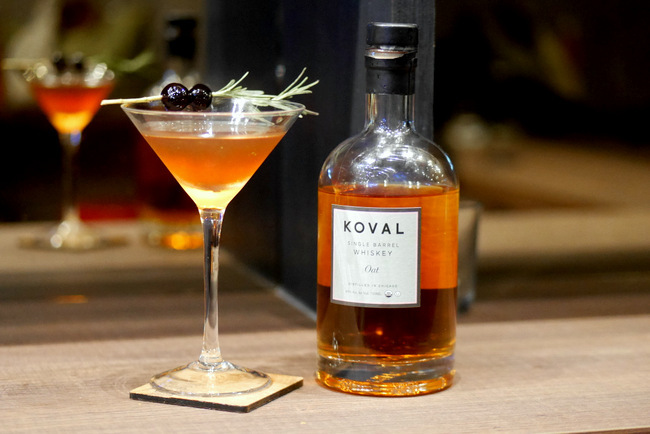 Head Bartender, Kelly Dcruz, of The Secret Mermaid serves up her version of a Manhattan, the Oat Manhattan, made with Koval Single Barrel Oat Whiskey. As we inch slowly into whiskey territory, it is time to give the Oat Manhattan a sip. 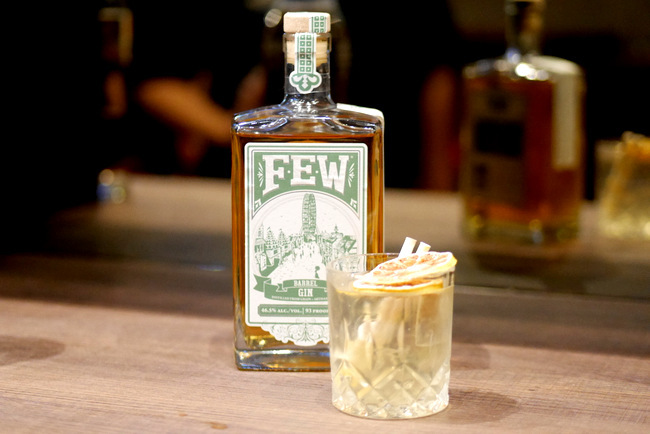 Made from Koval Single Barrel Oat Whisky, the cocktail works to show off the herbal yet sweet spirit. Think breakfast oatmeal with caramel and splash of fresh cream. Kelly ups the ante with rosemary, sweet vermouth, cherry and vanilla bitters to give us, essentially, a freshly baked fruit cake in a cocktail glass. 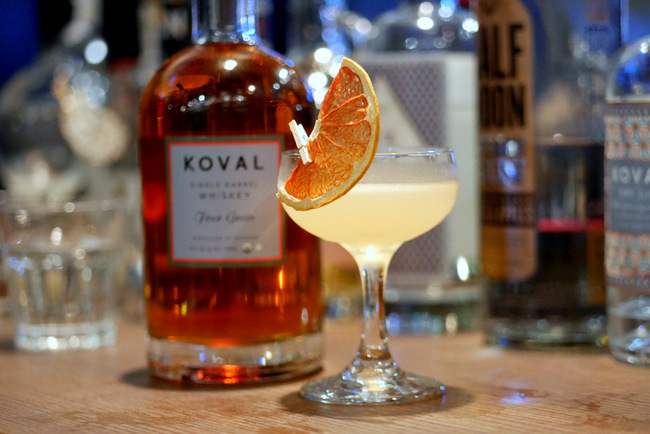 Head Bartender, Kelly Dcruz, of The Secret Mermaid uses the Koval Single Barrel Four Grain Whiskey to make a Cinnamon Raspberry Sour. 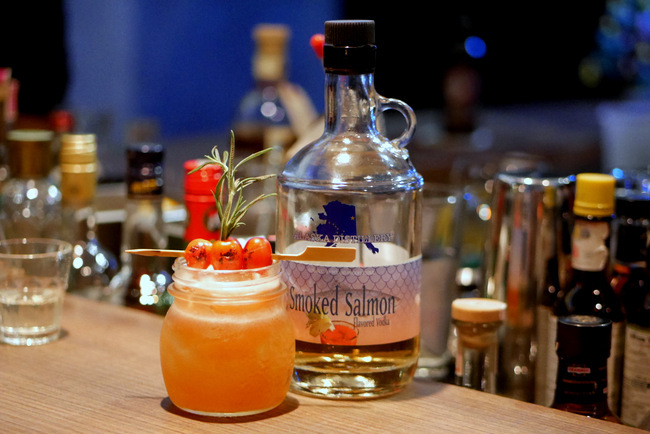 The Secret Mermaid also makes a mean Bloody Mary using Alaska Distillery Smoked Salmon Vodka. The exploration into Koval leads us into their Single Barrel Four Grain Whiskey. Like the name suggests, it is produced from four organic Mid-west grains; oat, malted barley, wheat and rye. Reminiscent of a creamy dessert with hints of cardamon and orange rind, the whiskey has layers of flavours from the grains and maturation in charred American oak. What’s surprising is how they all work together, balanced. Kelly uses a homemade raspberry syrup with cinnamon to create a refreshing Cinnamon Raspberry Sour. But, do give the whiskey a try on its own, for it is, without doubt, a very interesting bottle. 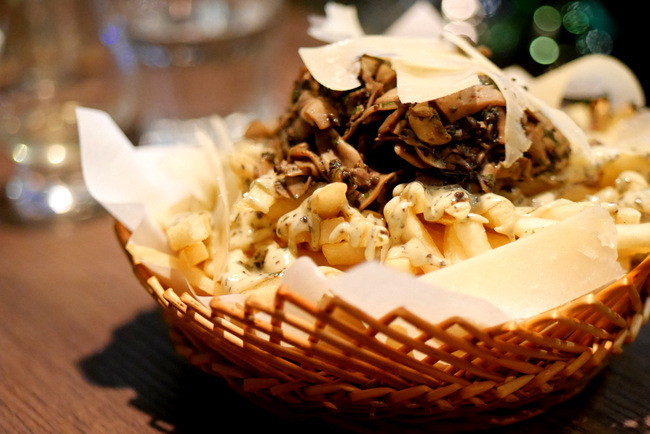 The Secret Mermaid also serves up bar bites such as this massive truffle fries, topped with creamy cheese and mushrooms. And, if you are feeling a little adventurous, or have already had a few drinks in you, you might just get the bar to whip up a very special Bloody Mary with Smoked Salmon Vodka. The spirit tastes exactly as you’d expect; smoked salmon in a shot. There is brine, there is smoke and, of course, the taste of salmon. Not the best straight up, but it sure made a pretty decent Bloody Mary. It is the sort of taste you’d either love or hate, there is no in-between. 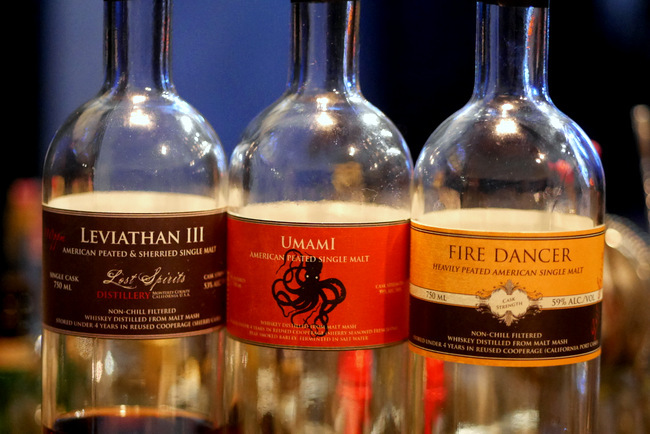 The Secret Mermaid offers tasting flights, including one for Lost Spirits. Pictured here is the Leviathan III, Umami and Fire Dancer American Single Malt Whiskies. Another must-try at The Secret Mermaid is the mad scientist-esque Santeria Rum from Rational Spirits. Cocktails aside, The Secret Mermaid is a tasting room for some of the most innovative spirits from America. 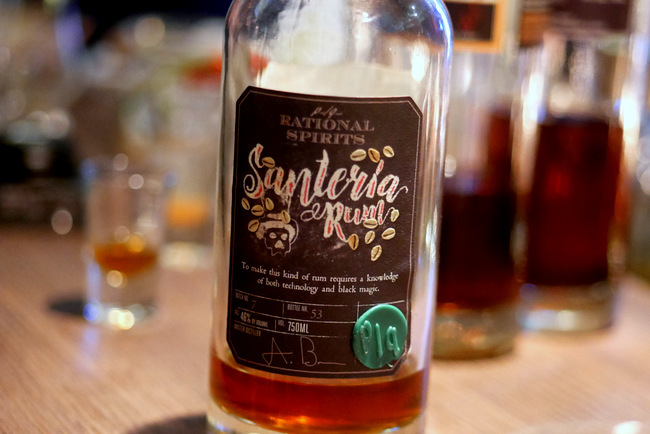 Here is where I would do a shoutout to Lost Spirits Distillery, and ask you to give their range of Single Malts and – wait for it – lab-aged “20-year-old” Santeria Rum. The distillery is the brain-child of art teacher turned mad scientist, Bryan Davis. From maturing his single malts in barrels that once held various styles of wine to artificially simulating passing of seasons, his most famous (or, infamous) creation is using his proprietary chemical reactor to age rum to 20 years in a week. Davis is not the first to play with accelerated aging, but he is surely winning the race. On the charts, it has the makings of a aged rum. In a blind tasting, you would be enamoured by the thick note of caramelised sugar and toffee. Undeniably, delicious. The Secret Mermaid is a true gem in the midst of the hustle and bustle of Raffles Place. Stepping into the bar is taking a back seat away from the madness of the daily grind, and embarking on a journey through the history and ingenuity of each bottling. And, with head bartender, Kelly D’Cruz standing behind the bar and always ready to share her passion for the spirits, every visit is sure to be an exciting one.